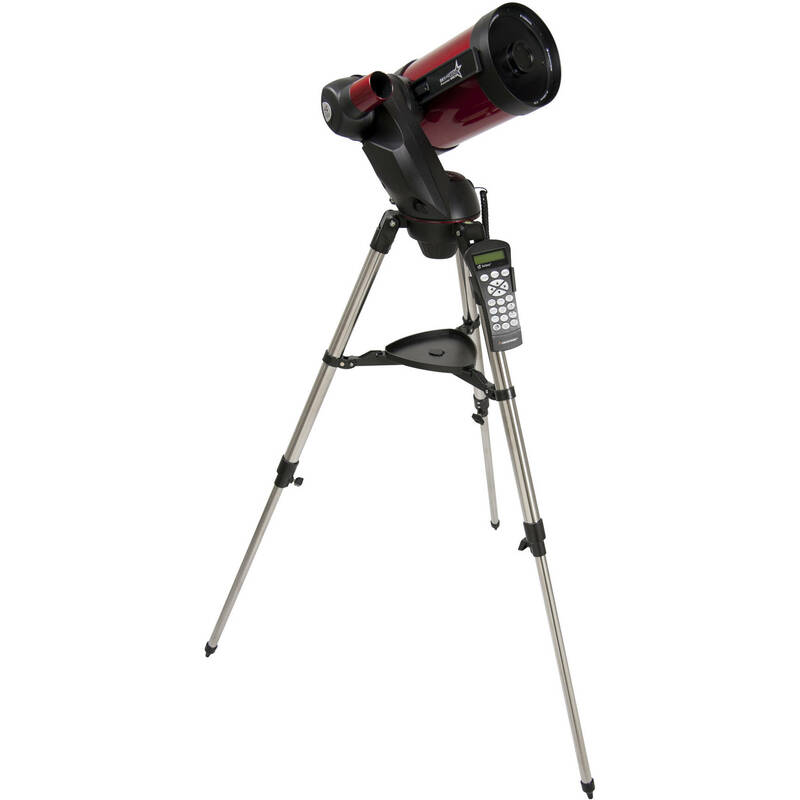 The Celestron SkyProdigy 6 152mm f/10 Schmidt-Cassegrain GoTo Telescope is designed for people who want to spend more time observing and less time setting up. In about three minutes, the StarSense system can automatically determine its position and align itself. Once this quick alignment is done, use the included hand controller to explore more than 4000 objects with full GoTo capabilities. Optically, the telescope is outfitted with a large-aperture Schmidt-Cassegrain optical tube assembly (OTA) that draws in copious amounts of light to enable detailed observations of the Moon and planets with the ability to resolve dim deep-space objects while still maintaining a compact and portable form factor. The light-gathering capabilities are enhanced through the use of Celestron's proprietary StarBright XLT optical coating system to maximize light transmission, ensure accurate color rendition, and eliminate fringing and off-axis comas. The OTA is attached to a fully motorized single-arm mount that is guided by the hand controller and supported by a sturdy stainless steel tripod. The entire system is powered by eight user-supplied D-cell batteries. To help new users start observing right out of the box, two eyepieces are included to produce moderate and high magnifications, plus a 90° star diagonal. The visual back and diagonal accept 1.25" eyepieces and accessories to allow the use of a wide variety of optional gear to be added later such as additional eyepieces, Barlow lenses, filters, and imaging systems. Aperture 152 mm / 6"
Box Dimensions (LxWxH) 29.8 x 29.0 x 15.2"
SkyProdigy 6 152mm f/10 Schmidt-Cassegrain GoTo Telescope is rated 2.6 out of 5 by 5. Rated 4 out of 5 by Swagman105 from A telscope to fill a need I regularly travel around the remote areas of Australia and have access to some wonderful night skies. We try to travel light and I need a portable and easy to set up and use telescope. The sky prodigy 6 system is ideal and in the clear skies have never had any problems with its auto set up process and in locating catalogue objects. A great talking and activity focus with the other travellers we meet. I do think that the supplied tripod is somewhat flimsy and have since modified a vixen tripod purchased cheaply secondhand to accept the base of the prodigy. It provides a vastly improved platform for using the scope and I have even attempted some basic astrophotography with it. I made my first telescope over 50 years ago as a youngster so I don't need to be trained to master the geometry of the night sky. Now I just want to get to the business end of observing as quickly as possible. 8 out of 10 to Celestron (points only deducted for the tripod and the lack of a 8 inch model. It is the way of the future. Rated 3 out of 5 by Enterand from Ought to be good - but isn't I took my time researching various scopes which would suit my desire for exploring deep space yet be easy enough for my young son to use. This scope should be perfect but it isn't. Sky Align is not accurate. It always seems to centre in 1 or 2 cm away from the object it is looking for. In astronomy terms this is massive! Then you can't actually realign as the system won't allow you to shift the scope. So bascially skyaign is pointless! Wobble. Oh my goodness the wobble. I was manually looking at the moon just half an hour ago but it's almost impossible to get a sharp image as whenever you touch the scope it wobbles so violently that everything goes blurred. To clarify I was viewing from a flat concrete surface so this should not happen.I ought to be happy with the scope but I'm not, I'm really really not. Maybe a new mount will fix the wobble but seriously I've just paid close to $1,000 already! Rated 4 out of 5 by Kimberly from received my RMA RMA came in last week and the scope works great the star sence is awesome for a person like me who doesn't know what she's doing, the RMA turn around time was only 2 weeks and I am happy with the purchase. Rated 1 out of 5 by David J from Would make a good paper weight... This is my second telescope. I read a lot about it before I made my purchase. I am comfortable finding things in the great beyond but wanted a telescope I could use with my young son. When it arrived I was pleased with how simple everything was to put together. But problems arose as soon as I took it outside. First of all the star alignment tool doesn't work properly. Sure it finds the three alignment points easily enough but when you actually look for something it doesn't align correctly and is always a couple of degrees out. You can't then manually correct the telescope until it lines up correctly meaning you are left staring at a dark piece of sky. $ for that??? Secondly this telescope is so unstable it will boggle your mind. I tried looking at the moon but every time I tried to focus the scope the vibration was so bad that I couldn't tell whether I was making the image sharper of unfocused. To be honest I gave up in the end. In an effort to make this telescope as light as possible Celestron have completely failed in making a usable scope. It doesn't even come with counterweights which would have offered some stability. When I contacted the tech support team to see if I could upgrade the tripod to something a little more stable I was told that the tripod was bepoke to the Sky Prodigy range and I should just put an exercise weight on the tray to steady it a bit more... seriously???!!! !I'll end this review with this. The SkyProdigy should be a good telescope. But it isn't. It is far too expensive to warrant such a shoddy tripod. The fact I can't even manually align it in the alignment mode is shocking. Essentially I have just paid $ for something which is little more than a paper weight.Really really really disappointed and would tell anyone looking to buy this scope to run in the other direction. Can you use 2 eyepieces with this scope? Unfortunately we do not sell adapters that convert from 1.25 to 2 to attach 2 eyepieces to 1.25 openings. Sometimes 2 eyepieces come with a converter, but you have to check the specifications, and what is in the box. Does it continuously track objects? yes it will, but keep in mind you must have it very level in a clear area with fairly clear skies. also recomend using an atomic watch because the date and time should be as correct as possible! can the 4000 object data base be increased? Asked by: r. roger h.
You can get the Celestron SkyPortal WiFi Module. The app features a database of over 100,000 objects with astroimages and audio descriptions of hundreds of them including the history, mythology, and key features of them.